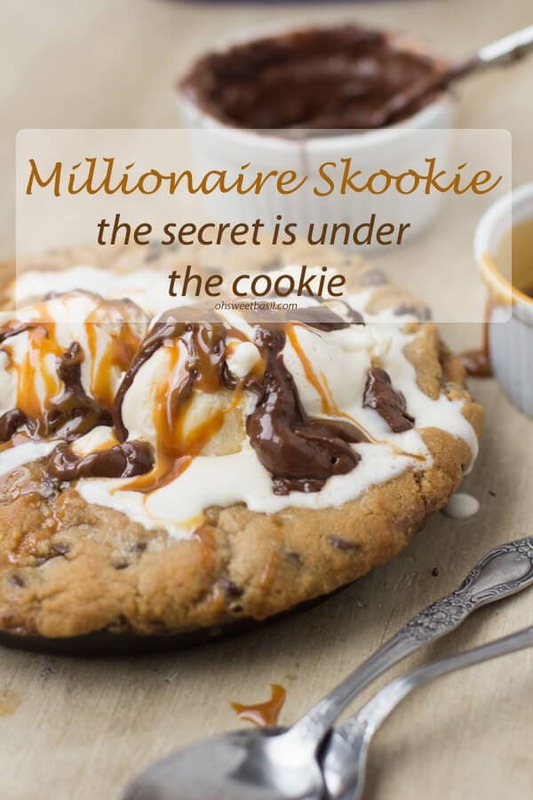 This millionaire skookie has a secret layer of nutella and dulce de leche under the cookie that would be worth millions if cookies were money. Dulce de leche is a creamy caramel sauce that’s traditionally made by simmering a pot of milk and sugar, stirring as you go, for seven hours. Want to know a secret? We don’t really watch the Super Bowl. 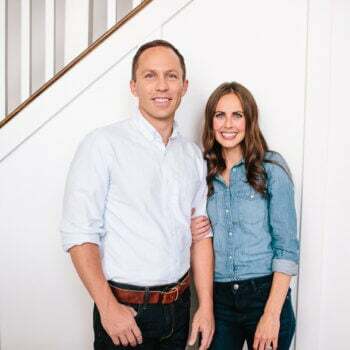 *GASP* I know, but we do still enjoy yummy food that weekend because we still want to gorge ourselves on deliciousness like the rest of America. Recently we got these bomb diggity Skookie pans from Camp chef and I have to say, I’m totally obsessed. We just took ours to a whole new level. It’s like a millionaire skookie. 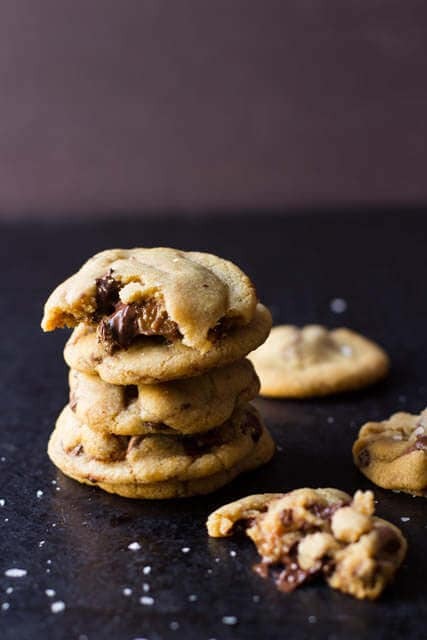 Think of the million dollar brown butter chocolate chip sea salt cookies we made ages ago but like a lava skookie version. What is a Skookie Pan? A Skookie pan is a shallow cast iron skillet, perfect for cookies, personal pizza, fajitas and more. I love the pans because they are smaller but still plenty big enough for 3-4 people per pan. Some people make huge skookies on pizza pans, but I’m not really down with that. In order for the middle to be cooked well enough you tend to over bake the cookie and we prefer the hot gooey, perfectly golden cookie. 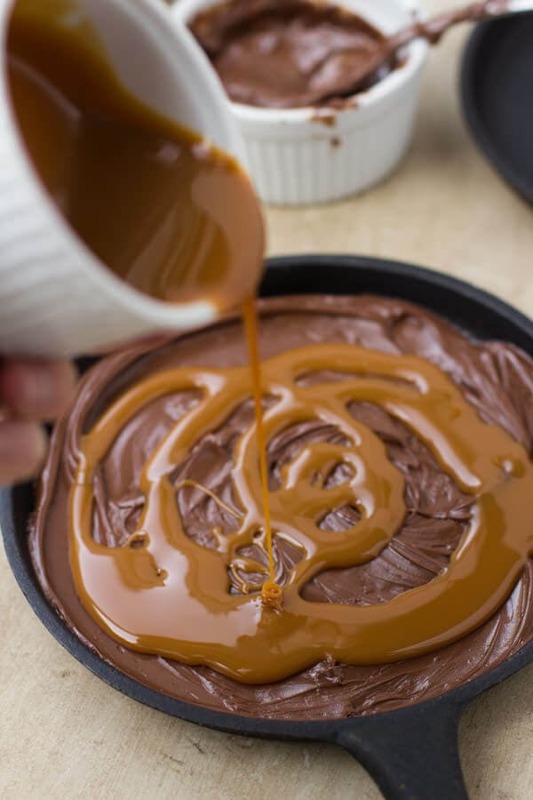 It all starts by spraying a little nonstick spray in the bottom of the pan and then spreading a perfect layer of Nutella all over the bottom followed by a lazy drizzle of dulce de leche (or caramel sauce if you can’t find the good stuff). Now just top with chocolate chip cookie dough and bake away. 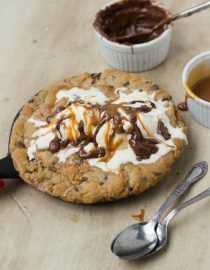 Pull this baby out and add ice cream (Tillamook or the Costco brand are our favorites) and chocolate fudge sauce and caramel! 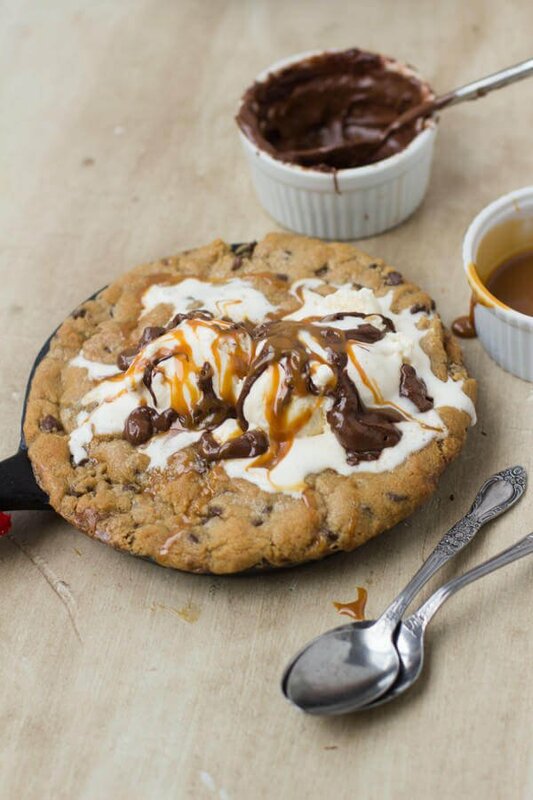 Spread a thin layer of Nutella and then dulce de leche over the bottom of the pans followed by the chocolate chip cookie dough over the top. 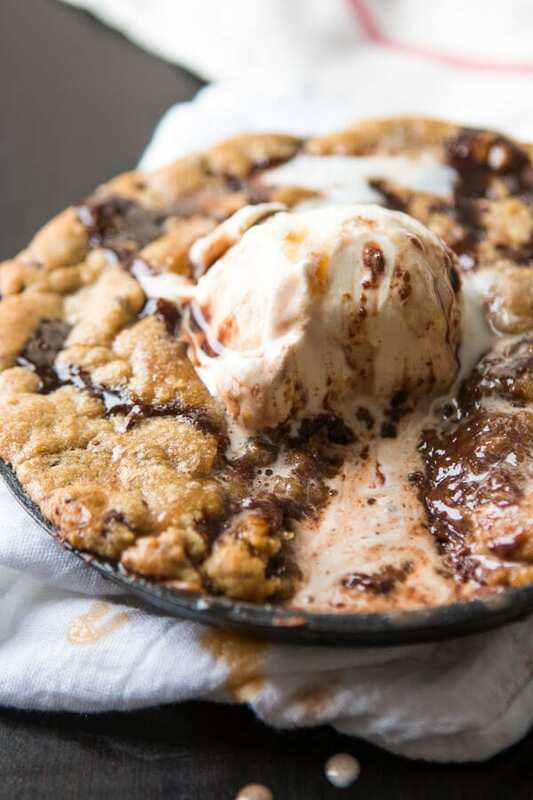 Don’t fill the pan over the top with the cookie dough or it will boil over. Only come just to the inside edge of the pan. It’s the easiest dessert that no one can resist. 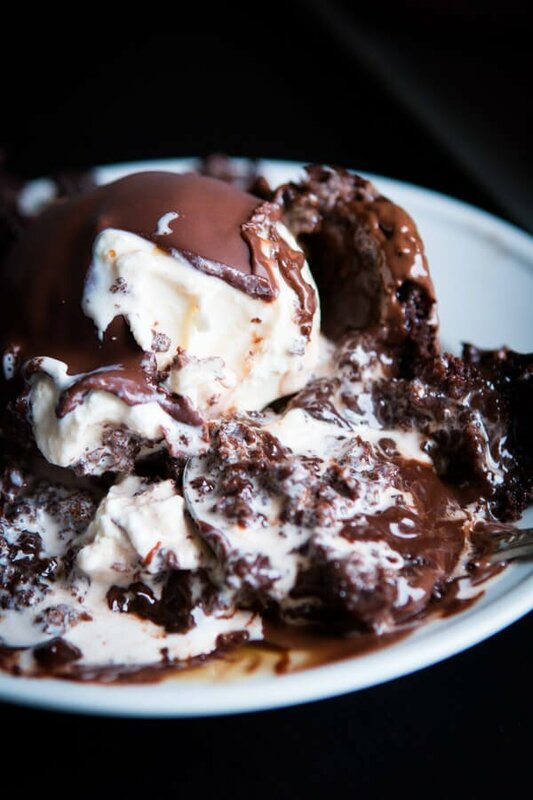 A moist chocolate cake filled with hot fudge, topped with ice cream and a homemade magic shell topping plus a drizzle of caramel. I’m not going to lie I’m pretty excited that I now have a use for my mini skillets and that the use is pretty deliciously amazing! Hope you love making this! THIS IS UNREAL. ohmigosh I could eat the entire thing myself!!! 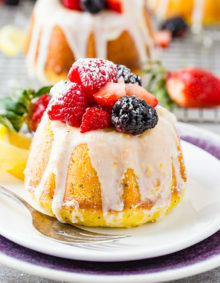 could these be made in individual ramekins? Where would I find “dulce de leche”? Is this similar to sweetened condensed milk? It’s actually sweetened condensed milk cooked down. You can find it in the international isle of any grocery store or sometimes by the sweetened condensed milk. If all else fails you can put the can of sweetened condensed milk (label removed) in a pot of water and boil for 3 hours, always keeping it covered in water. I’ve been cooking and baking for 53 of my 61 years, and have never heard of a skookie pan; where would I find them, please? I haven’t looked for new baking or cooking equipment for a very long time, so probably just need to look in the baking equipment section of my local big-box store? 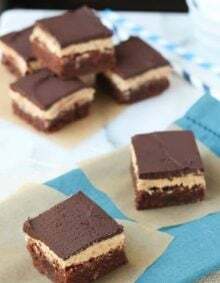 I noticed that your Brown Butter Sea Salt Stuffed with Nutella & Dulce De Leche has the recipe name of Million Dollar Cookie under it, is that correct? Just curious. Thanks, I am going to try these this weekend. Are these mini individual skookie pans or is it 3 large regular sized skillet skookie pans? Thanks! I’ve only seen the little ones that say they are individual but feed our entire family. About my two hands put together. Sorry, that’s like the most unprofessional way of saying that, but there isn’t a measurement, it just says individual. Holy cow!!!! This has my name written all over it!!! This looks heavenly Carrian! OMG! I want some right now!!! Can I dive right into this cookie? 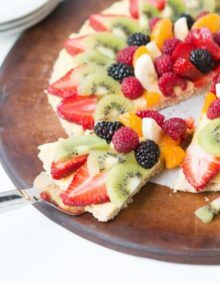 I would give up a weeks worth of dessert just for a bite of this, yum! All I can say is yuuuuuum! That’s all we could say too! Oh my goodness, I never would have thought to put toppings underneath!!! 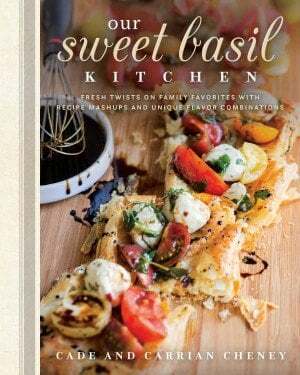 Definitely going to make this soon! It seriously makes this so amazng! girrrl did you really just post this after you thigh post?! lol I wanna hate but this looks WAY too amazing to say anything bad. ugh, my thighs be damned, I’m making this 🙂 pinned! LOL! I was just kidding around with someone about that! I’m a big believer in balance though. Work hard all week and take one night for a treat on the weekend! It’s 7:45 in the morning and I’m salivating over here! This looks so delicious! Where do you find the Skookie pans to cook it in? You can find those Skookie sets on Amazon but they are out of stock. Amazon has an option to be notified by email when they are back in stock. Bed Bath and Beyond has a bunch and I’ve seen them on amazon! Wow, Carrian! Seems almost too good to be true to have so much delicious happening in one pan! Thanks Kelli!! Hope you’re well! Oh my gosh. Nutella and dulce de leche UNDER the cookie? It’s like a surprise partay for my taste buds! I have no words. yes!! It’s totally a surprise party lol!